Enthusiastic folks ever-ready to celebrate various festivities, numerous communities getting along for a delicious meal called ‘Thali’, open-minded businessmen hailing their native place as a leading industry in the field of textiles and a capital, that proudly beholds the honour of having one of the best B-schools in the country (IIM-A), the vibrant state of Gujarat has it all! 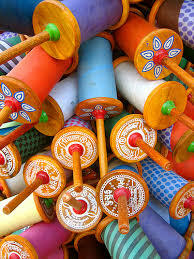 Another feather in its cap that it holds is the International Kite festival during Uttarayan. The place becomes more lively as thousands of kites fly high on the canvas of sky. 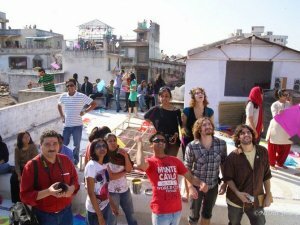 The festival of Uttarayan is one of the most celebrated festivals of India. Uttarayan celebration begins on the date of 14th January and lasts till 15th January (Vasi uttarayan) every year. 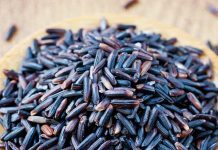 This day symbolises the change of winter season into summer according to Indian calendars and signifies harvesting season for the farmers. 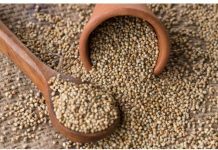 It is the sign for farmers that the summer’s here and that harvest season is approaching which is called ‘Makar Sankranti’. 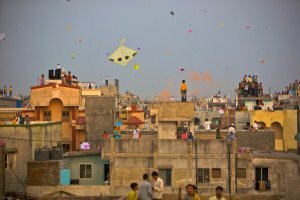 While communities in Gujarat are eagerly waiting for this occasion to arrive, many visitors from across the world come especially during this season to witness the vividness and participate in the activity of flying kites. Ahmedabad is the prime city that hosts this festival. In this instance, the Government has also allotted 2 consecutive holidays so that everyone shall participate actively and enjoy the festival. Offices and shops are shut down totally as the natives look out for the optimum terrace, rooftops, playgrounds and roads for kite flying which eventually also ends up being a social gathering. A healthy competition begins while each one tries to fly kite and sportively compete with their neighbors. Few say that India started this tradition of kite flying due to the Kings and then it was followed by Nawabs who found the sport entertaining and a medium to display their power whereas some believe that Persia’s Muslim traders brought this custom to India. The journey of celebrating the International Festival commenced from the year 1989 when people from all across the globe showcased their innovative kites. Expert kite makers and kite flyers from India and across the globe are invited to portray their skills and expertise in the art of kite flying and kite making with various shapes, colors, and sizes. 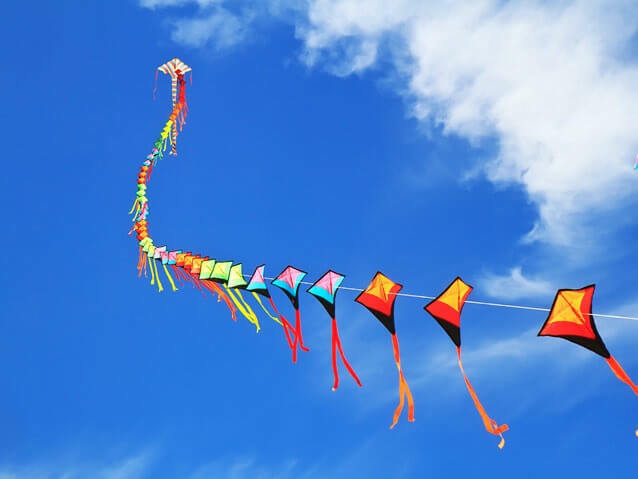 Since Gujarat has been a major hub of much of the trading activity, kite flying is acknowledged with intense excitement, which is now being observed as the Hindu Uttarayan festival. Earlier, only local or national kite makers were occupied in making this property for the event. Unusual kites with diverse shapes and colors was always the highlighted part. Gradually, after this festival received immense popularity, international guests and kite makers also started involving and now contribute their part to make the event a huge success. 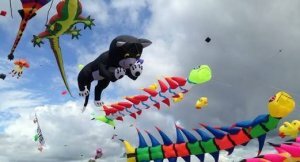 Hand Painted kites, sculpturous kites, windsocs and dragon shaped are few examples of designed kites. While the much awaited festival arrives, preparations are also being made in full swing! Days before the festival, the market is filled with people buying their supplies. Also, Gujarati dishes like ladoo, undhiyu or surati jamun which are prepared occasionally are enjoyed on this day. Kites are the major attraction since that element decides who wins the battle. 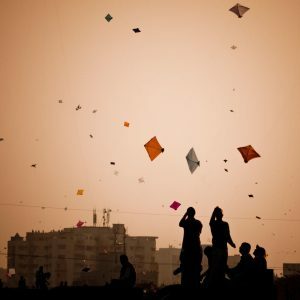 Although, it is Ahmedabad which hosts the International Kite Festival, the occasion is especially celebrated with great fervor in the cities of Surat, Vadodara and Rajkot etc. The aim is to battle with nearby kite-flyers to cut their strings and bring down their kites. Strong resilient kite bodies with springy bamboo frames and kite-paper stretched to exactly the right tension are the necessary demands of the buyers so that the Kite flies for a longer time. Lastly, the kites are then to a spool of manja, special kite-string coated with a mixture of glue and glass to be as sharp as possible for cutting strings of opposition’s kites. 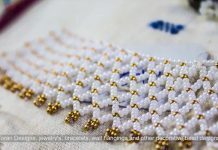 In the heart of Ahmedabad, this very renowned market- Patang Bazaar, is open 24 hours a day with buyers and sellers bargaining and buying it in wholesale. Such is the dynamism of Uttarayan’s International kite festival! Since Indians follow traditions and customs religiously, such activities make the aura more unique and special. Not every country or state gets to experience vivacity every now and then but Gujarat’s this festival makes its position in one those desirable occasions where people eagerly wait to spend some quality time, have delicious food and make memories for lifetime!